Beocord 1200 was important for two reasons. Firstly, it was the first B&O tape recorder that was specifically designed as part of a system of matching components. Secondly, it was the last open reel tape recorder that B&O would produce in quantity. Appearing when it did, it was not clear that the Philips compact cassette would emerge as the force in home audio recording that it eventually became, so a completely new open reel recorder was a natural step for a company keen to offer fresh, up to date products. Text copyright © Beocentral. Unauthorised reproduction prohibited. Beocord 1200 fitted into the range in a similar place to the previous Beocord 1800. The two are not directly comparable however, for whilst the 1800 verged on being a professional machine, the 1200 was definitely in the quality-domestic class. For a start, the 1200 did not have separate recording and replay heads, had no “slack absorbers” and only two speeds (3¾ and 7½ips) and was offered in the 4 track format only. In order to fit into the home more easily, the cabinet was made very slim (necessitating the use of a special “Papst” motor) and the mechanism was arranged so that it would function correctly either vertically or horizontally. To keep the spools in place, rubber caps embossed with “B&O” were provided. Folding legs fitted to the bottom cover had to be extended to support the machine if it was to stand upright. The familiar tape control levers were carried over from previous models, though the mechanics were all new, the layout was similar to what had come before. One major change was that the capstan flywheel was driven by a pair of parallel belts (to average out inconsistencies), and that speed changing was performed electrically by switching in different motor windings. Fast winding in either speed automatically ran the motor at full speed. The belts and pulleys could be inspected by removing the aluminium cover of the tape deck, it simply snapped into place and could be removed and refitted without the use of tools. Text copyright © Beocentral. Unauthorised reproduction prohibited. For domestic use, simplicity is important and the Beocord 1200 had a simplified control panel with the major settings being made by push buttons. These included the track switching, record source selection, tape speed and an “automatic level control” (more accurately a limiter), a function that would not be seen again on any Beocord until the 5500 of the late 1980s. A PA button was provided so that the microphone (or an auxiliary source) could be routed through to the main amplifier (presumably a Beomaster 1200). A basic headphone amplifier was included too, with its own volume control. Two recording indicators were fitted between the level meters, and these lit orange when a recording was being made. Though they didn’t look like it, they were in fact neon lamps, lit by the powerful AC voltage that was fed to the erase head. A clear plastic lid was supplied to protect the machine and tape whilst not in use, and because the cabinet had been designed to match the Beogram 1200, the lid was the same and could be interchanged. Text copyright © Beocentral. Unauthorised reproduction prohibited. Beocord 1200 was replaced by the ever improving cassette decks that appeared in the early 1970s. 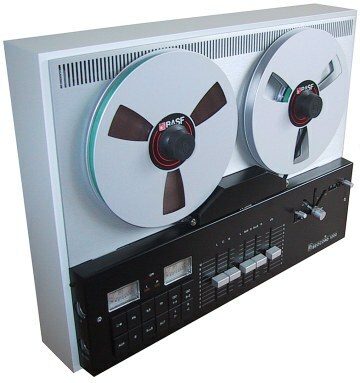 Models such as the Beocord 2200 offered refined mechanisms, chrome tape and Dolby noise reduction, all of which ate into the performance advantage that open reel recorders had enjoyed, though it was the compact size of the cassette decks and their tapes, and the convenience of operation the offered, that finally removed open reel from the domestic market. Text copyright © Beocentral. Unauthorised reproduction prohibited.